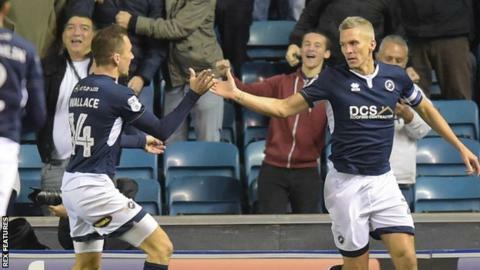 Two second-half goals for Millwall condemned Birmingham to their first loss under new manager Steve Cotterill. Blues full-back Maxime Colin turned Steve Morison's cross into his own net, before Ryan Tunnicliffe netted the second on the rebound after Tomasz Kuszczak kept out Tom Elliott's shot. Visiting striker Isaac Vassell missed the best chance of a goalless first half, firing wide with an angled shot. Blues have taken only one point from their seven away games this season. They are one point above the relegation zone, while Millwall moved up to 15th after responding to successive league defeats with their fourth Championship win of the season. Cotterill's managerial reign began with a home win over promotion-chasing Cardiff eight days previously. However, in his second game in charge, Blues struggled to create chances and could not stop the industrious Morison setting up Millwall's first goal. Che Adams was denied an equaliser by a smart save from home goalkeeper Jordan Archer, while Kuszczak kept out Morison's driven shot at the other end before Tunnicliffe's first goal for Millwall confirmed a deserved victory. Match ends, Millwall 2, Birmingham City 0. Second Half ends, Millwall 2, Birmingham City 0. Attempt saved. David Davis (Birmingham City) left footed shot from outside the box is saved in the centre of the goal. Corner, Birmingham City. Conceded by Tony Craig. Attempt missed. Jeremie Boga (Birmingham City) right footed shot from outside the box misses to the right. Assisted by Jonathan Grounds. Ryan Tunnicliffe (Millwall) is shown the yellow card for a bad foul. Isaac Vassell (Birmingham City) wins a free kick in the attacking half. Attempt missed. Lukas Jutkiewicz (Birmingham City) header from very close range is too high. Assisted by Maxime Colin with a cross following a corner. Substitution, Millwall. Tony Craig replaces Lee Gregory. Corner, Birmingham City. Conceded by Conor McLaughlin. Attempt missed. Jota (Birmingham City) left footed shot from outside the box is high and wide to the left. Assisted by Michael Morrison with a headed pass following a set piece situation. Jeremie Boga (Birmingham City) wins a free kick in the defensive half. Attempt missed. George Saville (Millwall) right footed shot from outside the box misses to the right. Assisted by James Meredith. Substitution, Birmingham City. Jeremie Boga replaces Che Adams. Goal! Millwall 2, Birmingham City 0. Ryan Tunnicliffe (Millwall) right footed shot from the centre of the box to the centre of the goal following a fast break. Attempt saved. Tom Elliott (Millwall) right footed shot from the left side of the box is saved in the top centre of the goal. Assisted by Lee Gregory. Substitution, Millwall. Tom Elliott replaces Steve Morison because of an injury. Corner, Millwall. Conceded by Tomasz Kuszczak. Attempt saved. Steve Morison (Millwall) right footed shot from the right side of the box is saved in the top left corner. Assisted by Jed Wallace.